From AskArt: Born in Carson City, Nevada, Warren Rollins became known as the “Dean of the Santa Fe Art Colony” and was at the height of his career between 1908 and 1928. 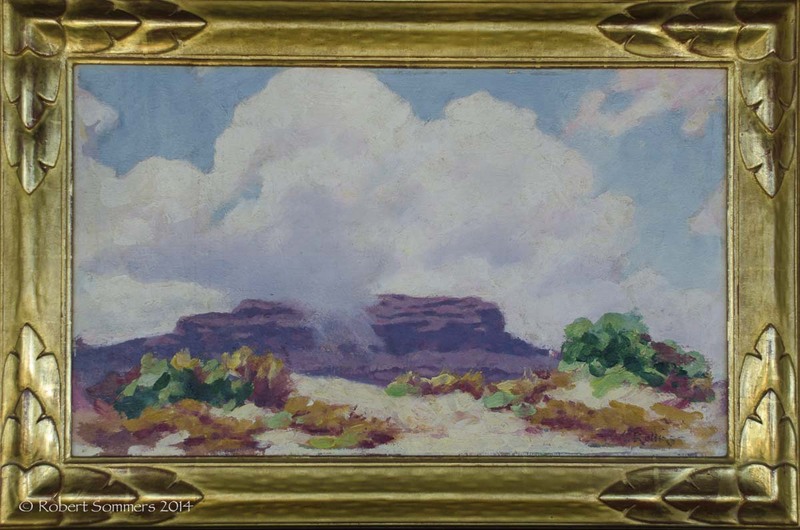 He was especially skilled at capturing the colors of the Southwest into his paintings. He first went West as an itinerant sign painter. He trained at the San Francisco School of Design where he briefly served as Assistant Director. In 1887, he settled in San Diego, and during this period, he became interested in Indian subject matter. He and his wife and two daughters then traveled through every Western state from Mexico to Canada, and in Montana, he did a portrait of Calamity Jane. During the sitting, she drank and wept and told him her story, and this portrait, treasured because it was the only one ever done of her, was lost in a fire at the Billings Club. By 1893, he was in Taos, then one of only four Anglo artists there, and he later returned where he had a studio near his close friend, E.I. Couse. In 1900, he spent a year in Arizona painting among the Hopi Indians and later the Navajo and Zuni tribes. The next year he began a commission for two historical paintings of the the Lewis and Clark Exposition. He painted the Grand Canyon so much that Santa Fe Railroad personnel built him a cabin on the rim at Paradise Point. Many of his paintings are in the Railroad collection. He settled in Santa Fe and earned a prestigious reputation as a teacher of art at the Palace of the Governors. He served as first president of the Santa Fe Art Club. His works were among the earliest to be shown at the new Museum of New Mexico, and his work appeared in about twenty-five exhibitions in Santa Fe between 1916 and 1977. He also did murals for the Museum as well as the post office and Bishops Lodge. He died at the age of 100 in Winslow, Arizona.